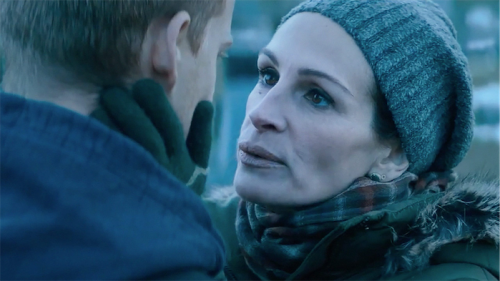 Julia Roberts as mother-of-four Holly in “Ben is Back”. WRITER/director Peter Hedges may be disappointed that his film, co-starring his son Lucas and Hollywood big-name Julia Roberts, has to the end of January since opening in the US early in December earned only 28 per cent of its production cost. US critics were mixed about the film. But there was great praise for Julia Roberts as Holly, twice-married mother of four, two by a white first husband, two by a black husband Neal (Courtney B Vance). In a long and lustrous career, Roberts is perhaps best remembered for “Pretty Woman” (1990) and Oscar-winning “Erin Brockovich” (2000). If “Ben is Back” gets up for any Oscars in 2020, I envisage its best chance will be for her performance as Holly. Perhaps not such a high expectation for the film as a whole, although Hedges has constructed a deft screenplay about the 24 hours that begin with Holly and the two younger children arriving home from shopping on Christmas Eve to find her oldest child Ben (Hedges’ son Lucas) waiting to get into the house. Ben was still supposed to be in rehab for cocaine addiction. Ben’s teenaged sister Ivy (Kathryn Newton) has reservations about the wisdom of his release. Holly is delighted, although she makes it clear that if he wants to stay it will be on terms that she spells out succinctly and forcefully. There’s a seventh member of the household. It’s a small black dog called Ponce. And his welcome is unconditional. Does this summary suggest that the film is going to be a feelgood family reunion? Were it so, it might be a potboiler. But it’s a strong drama in which Roberts and Hedges go through a day during which she has made it clear that she will never let him out of her sight. And she means it. Tensions build involving family issues, a meeting of Addicts Anonymous, encounters with friends and avoidance of former associates in the drug world and the dognapping of Ponce, leading Ben to escape Holly’s supervision to spend the night searching for the person responsible. What will Christmas morning bring? A bitter-sweet passage dallying over resolution just long enough to wear out its welcome. Pity.